An Absolute Monarchy is a form of government that was popular during medieval Europe and up until the end of the 18th century. It involved society being ruled over by an all-powerful king or queen. The monarch had complete control over all aspects of the society, including: political power, economics, and all forms of authority. The monarch was able to maintain absolute control over the society with the addition of feudalism, which involved people being placed into different estates of power, such as: clergy, nobility and peasants. 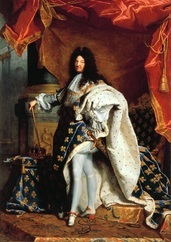 An absolute monarchy can best be seen in the words of Louis XIV in France when he proclaimed “I am the state”. Louis XIV, who ruled France as a monarch from 1661 until 1715, was expressing his absolute control over the society at the time by stating that he ruled over all aspects of the country and therefore was the highest and most powerful authority of the state. Absolute monarchies often contained two key features: hereditary rules and divine right of kings. Hereditary rule meant that the monarch received their position due to their birth and as one in a long family line of monarchs. As well, medieval European absolute monarchs included the practise of divine right of kings, meaning that the monarch derived his or her power from god. This furthered the power of a monarch because it ensured that the king or queen did not get their power from the people, and therefore the people had not control or say over the monarchs rule. The Enlightenment and its ideals of liberty greatly impacted the ability of absolute monarchs to continue to rule as they had. Influential Enlightenment thinkers questioned the traditional authority and right to rule of monarchs and began a wave of change across much of the Western world, including: the birth of capitalism and democracy. Today, very few nations continue to exist with an absolute monarch, but a few examples remain, such as: Qatar, Saudi Arabia, Oman, and Brunei.